I was on a quest today for something new and different. It had to be simple, quick, and using ingredients I had on hand. 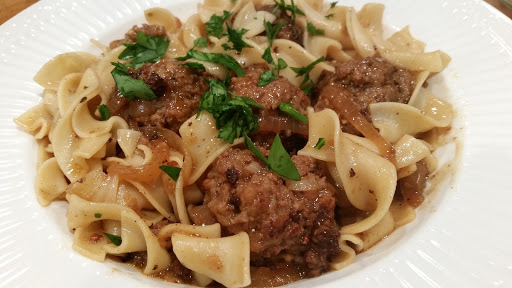 The result was Salsbury Meatballs that I served over egg noodles. With your hands, gently mix all the ingredients until well blended. You don’t want to overwork it because it will make them tough, but you do want everything well combined. 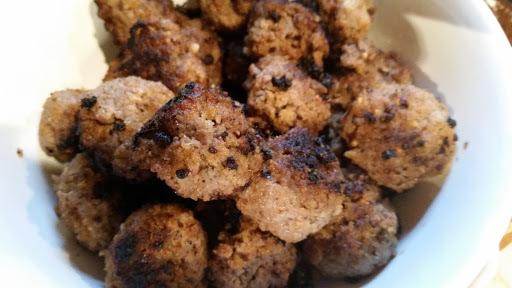 Form into meatballs about one inch round. In a large skillet, heat your olive oil and brown the meatballs on all sides. They do not have to be completely cooked because they will continue cooking in the sauce later. Remove from the pan and set aside. Drain the remaining fat from the pan where you cooked your meatballs. Add the butter and onions and saute until the onions are translucent and tender. Add the beef broth, ketchup, mustard, and Worcestershire sauce, scraping all the goodies off the bottom of the pan. Bring to a light boil. 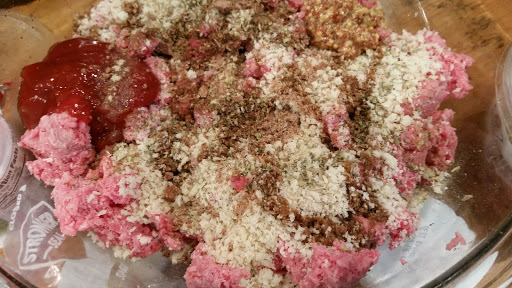 Meanwhile, add about a 1/4 cup of beef broth to 2 tablespoons of all purpose flour. Mix well until all lumps disappear. When the sauce begins to boil add this mixture to it. This will thicken your sauce. 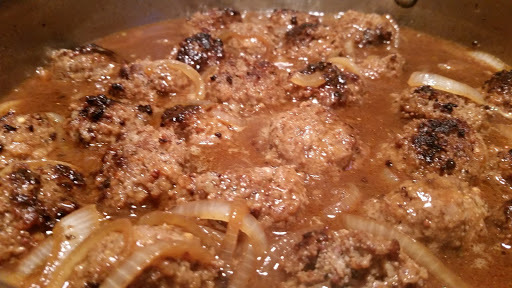 Add the meatballs to the sauce and simmer for 10-15 minutes. I served this over egg noodles, sprinkled with Parmesan Cheese and fresh parsley. Went to make these last night, but did not have several ingredients (like flour, beef broth, or bread crumbs). Just left out the flour and substituted toasted rolled oats for the bread crumbs and coconut milk for the broth…and it was still delicious!!! !